As Christmas approaches, I’m finding it increasingly hard to find time for the garden and even the faithful iPad’s becoming something of a stranger. Outside our French windows in London, the terrace and lawn are smothered in butter-yellow leaves from the wild plum tree in a neighbouring garden. I know they need sweeping up, but I’m only ever at home when it’s dark. The fish in the pond are still swimming around and enjoying the cool clear water. It would be a lovely autumn scene, were it not for the ever present scaffolding which has blighted our summer and looks set to stay put well into winter. So it was refreshing to get out and about in the daylight yesterday, albeit on a work related mission to Zurich. We swapped a mild rainy London for a cold, foggy Switzerland, where every other item in the shops was a watch, candle or chocolate. Can’t be bad. I can only describe Zurich as wonderfully dull. It’s a clean and solidly built city, but not what one might call pretty. The ample luxury on offer is always understated and even the shoppers look expensive. I don’t think I’d survive there for long! The city is dotted with elegant stone drinking fountains, all working (which would never happen in London) and gently spouting water the colour of opals. 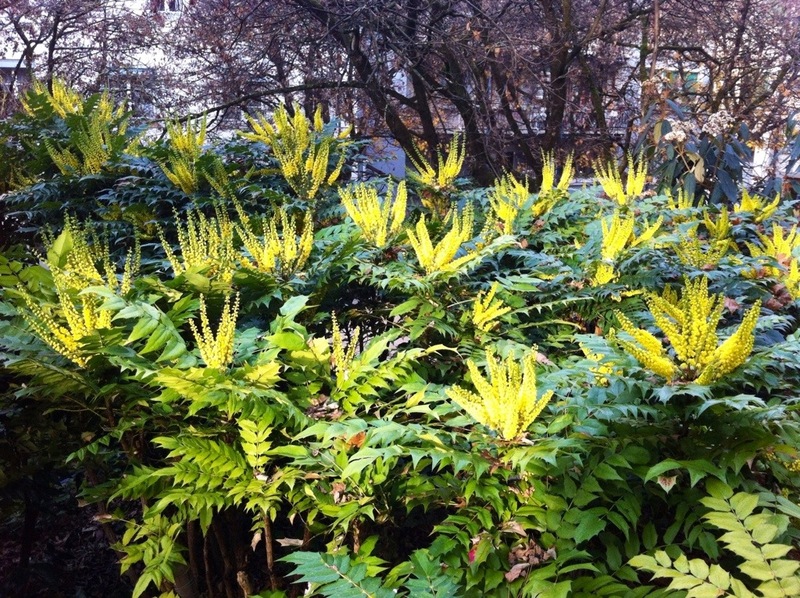 Close to one of these I spotted this wonderful stand of Mahonia, with its flowers lit by a momentary shaft of sunlight. It reminded me so much of my grandmother, who grew this marvellous, architectural shrub alongside camellias, bamboos, hardy fuchsias and cordylines, to create a very Cornish backdrop for her garden. She grew Mahonia × media ‘Charity’, which might very well have been the variety pictured here. Mahonias make great shrubs for a woodland setting, enjoying partial shade, and can be relied upon to light up the shadows with their clear yellow flowers throughout autumn and winter. They’re not at all fussy about soil or aspect and may even reward you with a delicate fragrance reminiscent of lily of the valley. 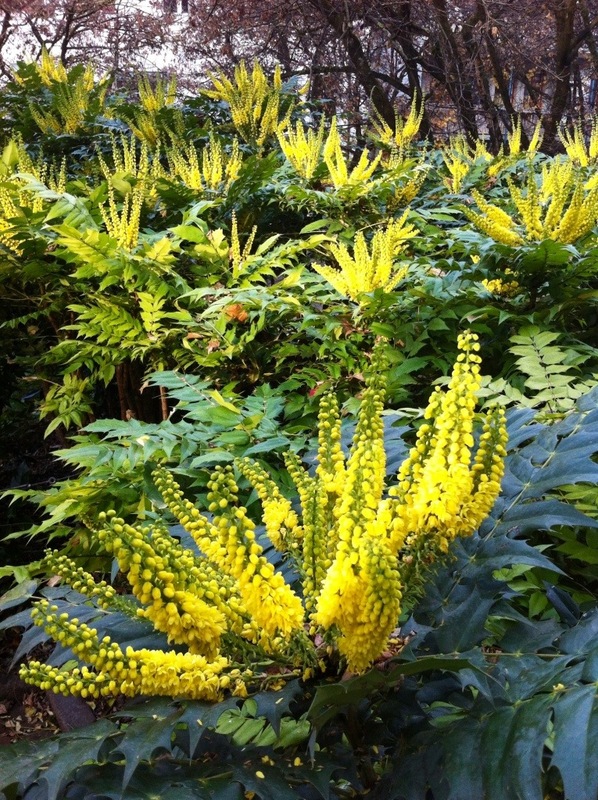 Back in London our own Mahonia is yet to flower, but after the leaves have finally been cleared we know we can look forward to another cheery splash of yellow to brighten the winter gloom.